The diversity of Indian cuisines and the variety of spices, legumes, and grains is a bit overwhelming and I cannot claim that I know much about it. That does not prevent me from tinkering with Indian recipes every now and then because I love Indian food, and there is no place to eat anything remotely authentic around here. The other day I pulled out a jar of yellow split peas and a jar of Toor dal from our pantry, wondering whether I had accidentally stored the same thing under different names. But when I looked closer and did a little research, I found that the two are indeed different. Yellow split peas are peas, as their name says. 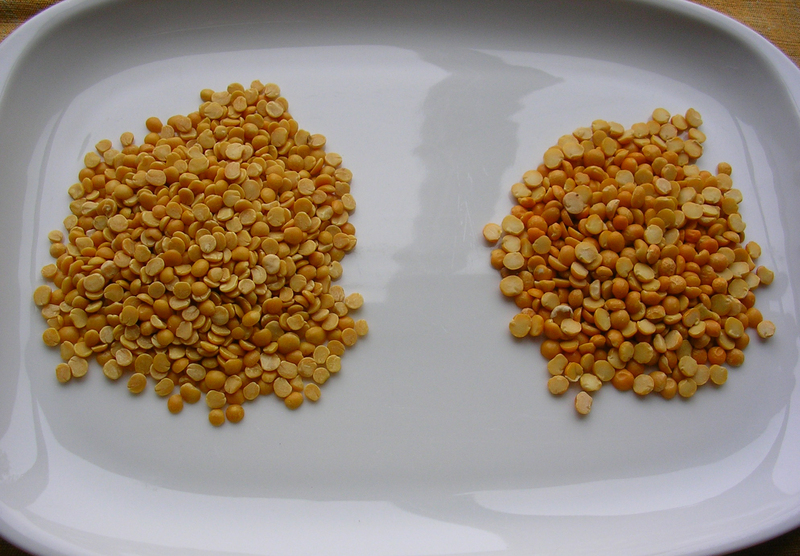 They usually do not need to be soaked and cook quicker than Toor dal, which are yellow lentils. 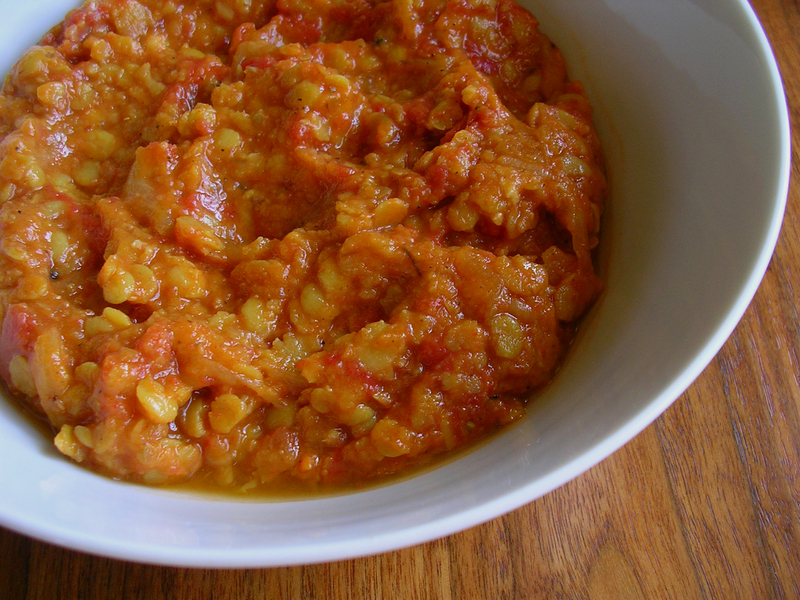 Sometimes Toor dal is referred to as pigeon peas, which is confusing. The Cook’s Thesaurus tells me that the Indian name for yellow peas is Matar dal. Toor dal come plain or oiled and need soaking because they have a hard shell. 1. Rinse the lentils under cold water to discard any impurities. Put in a bowl and cover with cold water. Soak for 3 hours. 2. Put the lentils in a small pot with the soaking liquid and add the turmeric. Bring to a boil. Reduce the heat and simmer for 30 minutes, or until the lentils are soft. Set aside. 3. Heat the vegetable oil in a heavy medium-size pot. Add the spices and fry them for 1-2 minutes, stirring. You should smell their scents but take care not to burn them. 4. Add the onion and fry over medium heat until golden, about 10 minutes, stirring often. 5. Add the garlic and ginger and cook for 1 minute, stirring. 6. Add the curry leaves and the tomatoes. Mix well and cook covered over low heat for 15 minutes. Add a little bit of water if the tomatoes don’t have a lot of juice. 7. Add the lentils with their cooking liquid. Add salt and cook covered for another 10 to 15 minutes, stirring occasionally and checking for water. Season with salt and pepper. 8. Remove the cinnamon stick, curry leaves, and cloves. Serve with basmati rice. So, got any recipes for yellow split peas, I have a huge bag now.